The Alaris 8100 provides excellent patient care as a light weight, large volume pumping module that is easily attached to the Alaris 8015 or 8000 PC Units. This infusion pump module has dose rate calculations and many other advanced features for the caregiver. The Alaris 8100 can be pole mounted and used in many versatile clinical settings for adults, pediatrics, and neonates. 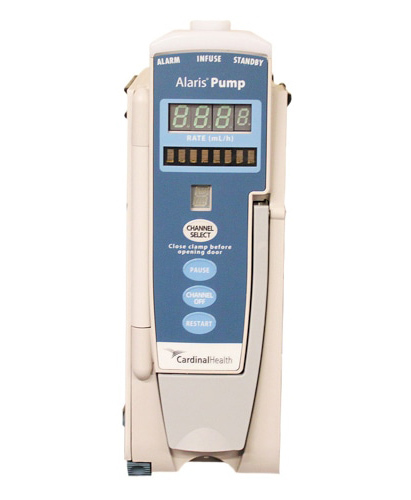 The Alaris 8100 is intended for facilities that utilize infusion pumps for the delivery of fluids, medications, blood, and blood products using continuous or intermittent delivery through clinically acceptable routes of administration; such as, intravenous (IV), intra-arterial (IA), subcutaneous, epidural, enteral, or irrigation of fluid spaces. Med One's large inventory of the Alaris 8100 Pump Module and all parts of the Alaris System allow us to fit your facility's needs. All the necessary tubing for the Alaris Pump Module can also be purchased from Med One here.